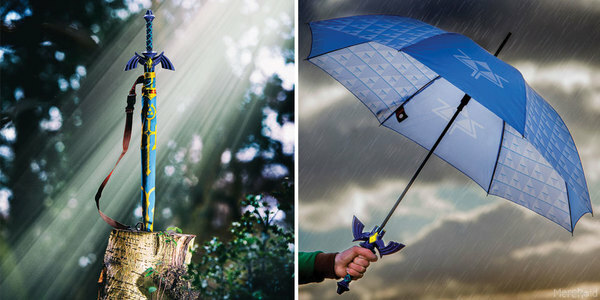 Official gaming merchandise retailer, Merchoid has revealed the Legend of Zelda Song of Storms Umbrella. Officially licensed by Nintendo, the design is modeled after Link’s infamous Master Sword and transforms into an umbrella at the push of a button. The umbrella is deployed simply by pressing the release button located near the top of the molded handle. The waterproof canopy features a repeating pattern of triforce emblems in pale blue with alternate darker blue panels with a single larger crest.Upon closing the umbrella there is a tie tag to secure the canopy in place. The umbrella is available to preorder now from Merchoid for $34.99.